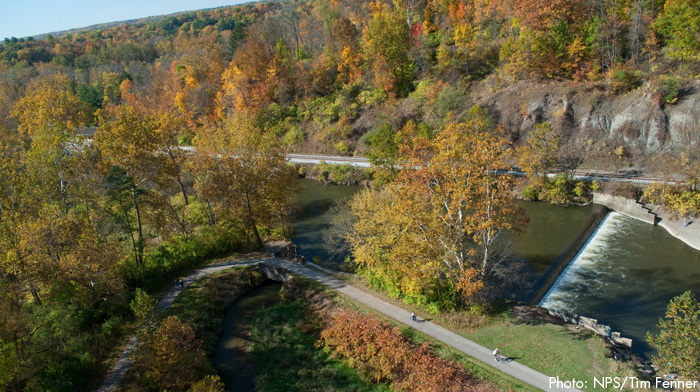 This 5.2-mile stretch is where the 1,400-mile Buckeye Trail joins the Towpath Trail. It is much more secluded and removed from roadways than the northern leg, which brings trekkers down to Frazee House from Rockside Station. A short bridge takes you across the canal and to the trail. Once across, proceed south through Horseshoe Bend, also known as “The Devil’s Elbow,” and you’ll enjoy a secluded and picturesque stretch called Pinery Narrows, a National Historic Landmark named for the many white pines that used to decorate the landscape. Some remain, along with Eastern hemlocks and other indigenous trees. The grand arches of the State Route 82 Bridge also highlight this leg. Take I-77 to Pleasant Valley/Alexander Rd. Exit. Proceed east on Pleasant Valley Rd. to Canal Rd. Turn left and continue on Canal Road for a half-mile until you arrive at Frazee House. Parking is available at the Trailhead, as well as at the Station Road Bridge Trailhead along this route (Riverview Rd., south of SR-82). Entrance to the park is free. Tickets are required for the Cuyahoga Valley Scenic Railroad. Outside of the beauty found at the bridge arches and the Frazee House, there is a special feature to the area: eagles. The Pinery Narrows have served as home to nesting bald eagles nearly every year since 2006, when a pair nested for the first time in seven decades in Cuyahoga County. Since that time, nine eaglets have hatched and fledged in this section of CVNP. Heads up: Trail restrictions may be in effect when eaglets are nesting. Additionally, the great blue herons have a nesting site there, making this a great birding destination. Even if you’re not a birder, this section of trail will provide intrigue because of the nature of the valley here. Brecksville Diversion Dam on the river just north of Station Road Bridge is worth a look, given that it diverts water into the canal from the main river and is actively maintained. As a moderately flat trail comprised of crushed limestone, this is a good trail surface for some rolling non-bike traffic, such as strollers and wheelchairs. Just about everyone. This section of the Towpath is fairly easy, with elevation changes of 10 feet. It’s not especially challenging, which makes it accessible for all skill levels. All manner of hikers, bikers, runners, and skiers will enjoy this leg. With plenty to take in along the journey—and serving as entry into the Brecksville Reservationc of the Cleveland Metroparks, where the longer and more challenging Buckeye Trail continues—it can be a nice half-day hike or lead to a much longer excursion.